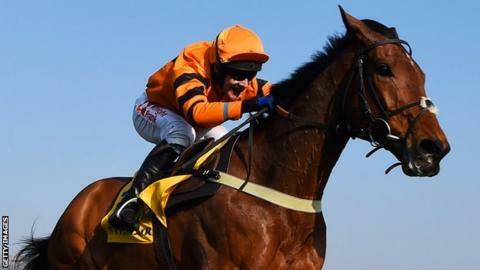 Thistlecrack justified his favourite's tag to win the World Hurdle at Cheltenham in impressive style. Tom Scudamore's mount, trained by Colin Tizzard, was barely troubled in the three-mile staying hurdle on day three of the Festival. The even-money favourite got away from his closest rival Alpha Des Obeaux (8-1) approaching the last. He powered up the hill to win by seven lengths with Bobs Worth (33-1) a distant third. It gave Scudamore his ninth Festival success and his second of 2016 and was the only English-trained horse to win in the seven races on St Patrick's Day. "I've spent my whole life running around in these races, nearly getting there, and finally I've got a horse like this," he said. "It's unbelievable, I never realised it could be so easy. "I always had lots of confidence in my fella, once we jumped the last it was all over. That was fantastic, what a racehorse. I think it's fair to say he's the best I've sat on." For jump racing, Cheltenham is all about crowning champions. Some winners ooze quality more than others, but Thistlecrack was magnificent, stalking the leaders before easing into the lead when asked and quickly putting the race to bed. Colin Tizzard spoke of not having to be part of a "big battalion" to find a superstar, and that was not lost on anybody. Of course Willie Mullins is doing great things, but it's important too that the smaller outfits like Tizzard's get a look-in. Tomorrow they take on Mullins and Co in the Gold Cup with Cue Card. Earlier, Vautour (evens) landed a comfortable win in the Ryanair Chase - one of three wins on St Patrick's Day for jockey Ruby Walsh - who passed the 50-winner mark at the Festival - and trainer Willie Mullins. Vautour had been due to run in Friday's Gold Cup but bypassed that one to land his third Cheltenham Festival win in a row. Road To Riches tried to challenge but once Walsh got his mount into gear as they turned from home, he looked impressive. He went on to win by six lengths with stable-mate Valseur Lido (11-1) grabbing second from Road To Riches (7-1). "If you were watching him at home I'm not sure you'd even have run him in the Ryanair," said Walsh. "He worked half all right on Saturday morning, I wouldn't say he worked well. If you'd watched him up until then - I'd written him off in my mind, but Willie gets it right doesn't he?" "She's a very talented filly, all we had to do was iron out her jumping but she schooled really well the last fortnight, very slick," said Walsh. "There was never a moment's worry. She travelled well and jumped well. If she'd got beat it wouldn't have made sense as she's been working with some good horses. "Stamina wasn't an issue. We told everyone for the last six weeks and she was just a shade of odds-on." Jockey Davy Russell made up for his disappointment after being unseated from Zabana at the start of the opening race of the day when Mall Dini (14-1) took the Pertemps Network Handicap Hurdle Final to give trainer Patrick Kelly his first Festival success. In a tightly contested finish the winner came out on top by three-quarters of a length from Arpege D'Alene (14-1) with the unlucky If In Doubt (10-1) a head away in third and top-weight Taglietelle (14-1) fourth. "He's still a novice, all credit goes to Pat Kelly. What a man, not many people know him, he's a very shrewd man from Galway," said a delighted Russell. "The tongue strap has definitely helped him, he was overdoing things a bit and not breathing properly. It's all Pat Kelly's doing. He knew what the horse wanted. He's a genius." There was yet more Irish success in the day's other two races, as Bryan Cooper, who will ride the well-fancied Don Cossack in Friday's Gold Cup, gained his first win of the week when Empire of Dirt (16-1) won the Brown Advisory & Merriebelle Stable Plate for trainer Colm Murphy. Then, in the final race of the day, the Fulke Walwyn Kim Muir Challenge Cup for amateur riders, Jamie Codd claimed his fourth victory in the race on board the Gordon Elliott-trained Cause of Causes (9-2).